María Isabel Urrutia Ocoró, Olympic champion weightlifter and politician, was born in Calendaria, Department of Valle del Cauca, Colombia, on March 25, 1965. Her mother, Nelly, was a homemaker and her father, Pedro Juan, was an industrial mechanic. Sources differ, but Urrutia had at least thirteen siblings in her youth, with only four surviving siblings when she competed in the 2000 Summer Olympics in Sydney, Australia. One year after her birth, Urrutia’s parents moved the family to Cali, Colombia, and settled in the barrio of Mariano Ramos. When Urrutia was thirteen, she competed in the Colombian youth nationals in Bogotá and set a new shot put record in her first competition. She followed this with victories in the shot put and discus throw at the 1979 South American games in Chile. Her father opined that her sport was detrimental to women. Nevertheless, Urrutia continued to compete and win. Also in 1979 at the age of fourteen, Urrutia began her twenty-three-year tenure as a phone operator with Empresas Municipales de Cali, the city’s public utilities company. This was Urrutia’s source of income for her training. Her schedule demonstrated her zeal in her sport. The teenager woke up at 4:00 a.m., worked from 6:00 a.m. to 2:00 p.m., trained from 3:00 p.m. to 5:00 p.m., and then went to school from 6:00 p.m. to 10:00 p.m.
Urrutia’s athletic prowess landed her a place on the Colombian Olympic team in the 1988 Seoul (South Korea) Summer Olympics. She failed to qualify and contemplated retirement. Just then, her future trainer, Gantcho Karouchrov, convinced her to try weightlifting. Less than three months after her introduction to the sport, Urrutia captured silver at the 1989 World Weightlifting Championships in Manchester, England. She dominated her division of 82 kilograms (180 pounds) from 1990 through 1996. 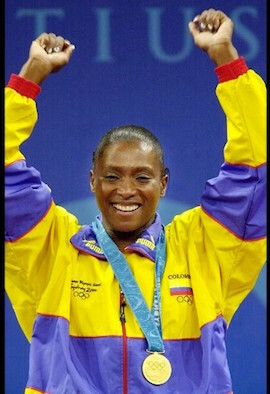 Urrutia tore her knee cartilage eight days before the 1999 Pan American games in Winnipeg, Canada, but she dropped weight to 75 kilograms (165 pounds) and managed to win a silver medal. The injury at Winnipeg forced Urrutia to compete in the 2000 Sydney Olympics at 75 kilograms. This was the first Olympiad where women were allowed to compete in weightlifting and, at thirty-five years old, Urrutia felt it was her only opportunity to capture gold. The top three athletes lifted the same total weight of 245 kilograms (540 pounds), but Urrutia won gold because she weighed less than the silver and bronze athletes. In doing so, Urrutia was the first Colombian athlete to bring home an Olympic gold medal. The press instantly and affectionately called her La Negra de Oro (loosely, the golden black/African). From 2002 to 2010, Urrutia held a seat in the Colombia House of Representatives. She also ran for mayor of Cali on a platform of social justice for women, people of African descent, and other marginalized peoples but lost the election. Mauricio Silva, “Esa medalla era para mí. Me la habían guardado.” Revista Bocas: Circulación con El Tiempo, (Bogotá, Colombia), September 20, 2015, http://www.eltiempo.com/bocas/maria-isabel-urrutia-entrevista-bocas/16381316; Timothy Pratt, “The Athlete Who Took a Nation's Strain: Timothy Pratt in Colombia Reports on a Golden Triumph that Overcame Poverty and Civil War,” The Sunday Herald (Glasgow, Scotland), October 1, 2000. p8. War,” The Sunday Herald (Glasgow, Scotland), October 1, 2000. p8.